The process of bringing water to a boil may be as old as time, but that doesn't mean your kettle has to be. 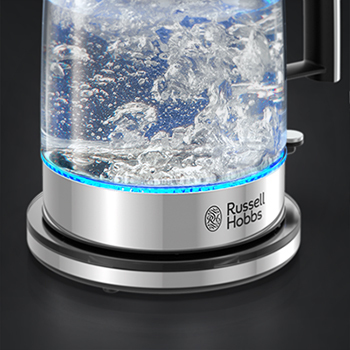 The RUSSELL HOBBS® Glass Electric Kettle features eye-catching blue LEDs that illuminate while water boils, offering an ultra modern feel to a more efficient method of boiling water. Whether you're a devoted tea aficionado or enjoy hot cocoa, oatmeal, or French press coffee, this kettle is as useful as it is attractive. You'll soon discover it's not only one of your favorite small kitchen appliances, you won't be able to live without it. The premium glass construction displays the rapid boiling of up to 1.7L of water, with measurement lines for accurate filling. To serve, simply lift the kettle at any angle from the base, and watch as the drip-free pour spout delivers a single stream of water into the intended cup or bowl. 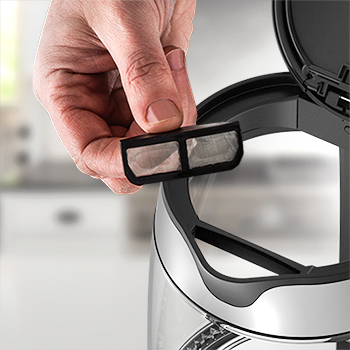 Additionally, the removable anti-scale filter helps prevent mineral buildup from passing through the kettle's spout. 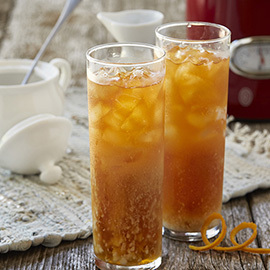 Enjoy the perfect cup, at the perfect temperature every time. Beautiful and strong, the premium glass kettle places the illuminated boiling water on display, creating an eye-catching attraction in your kitchen. 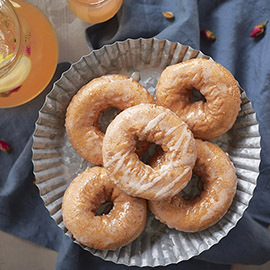 Pick up and set down the kettle at any angle. The swivel base makes transferring the kettle easy. The ring of lights on the inside of the kettle illuminates during operation. This brilliant blue light shines through the water as it comes to a rolling boil, creating a mesmerizing display each time. The large capacity makes this kettle ideal for families and for hosting events. Boil up to 1.7L of water for tea, oatmeal, pour overs, French press coffee, and more. 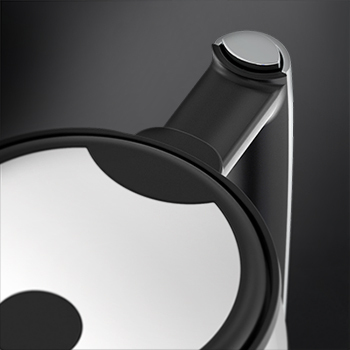 The pour spout is designed to prevent dripping by creating a single stream that keeps boiled water safely contained. 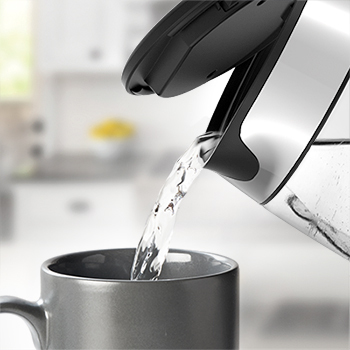 Push the release button at the top of the handle to pop the lid open and watch as the drip-free pour spout delivers a single stream of water into your cup or bowl. Beautiful and strong, the premium RUSSELL HOBBS® Silver Glass Accent 8-Cup* Coffeemaker makes for an eye-catching attraction in your kitchen. Rated 5 out of 5 by Anonymous from I Love This Thing I’ve only had stove top tea kettles up until now - and since I forced them to live where they worked, 80% of its surface area was covered in cooking grease and water spots with the remaining 20% occupied by the blackened “looks like its been on actual fire” base. Throw in the fact mineral deposits caked on the inside were treated like the son the kettle never had and therefore couldn't be removed no matter how hard you scrubbed, its a wonder it took me 34 years to upgrade. I personally don’t have the best luck when it comes to selecting and buying appliances, so you can imagine how stoked I was to nail my first electric kettle purchase. First, it boils water, stupid fast - letting you know its done with a gentle click sound vs the usual obnoxiously loud whistle that scares farts out of my dogs. Second, it features a cool blue light that comes in handy when I find myself too lazy to walk the additional 2 feet to the light switch. It has a short cord you're not forced to secure with a twist tie and wishes after a 34 level loop fold, and even looks cool enough for me to leave out on the counter without it even having to try too hard (full disclosure - the matching glass toaster I purchased previously was already shouldering that weight). So happy with my purchase. Would recommend to friends. And if I hadn’t JUST bought one of those cup coffee machines - I would def be considering snagging the matching gray glass coffee maker. Rated 5 out of 5 by Chuck from fantastic I bought this kettle for my wife. At times, she doesn't want to wait for drip coffee. So, for instant, her new kettle is really fast. She loves it. Now, we use it to get water up to temp quickly to blanch. Or, a quick way to getting to a boil for whatever cooking purposes. I don't know how to explain it, but we have many ways we use this fantastic looking, and productive kettle. Although perfect volume for most purposes, I'd like to have a larger version for bigger applications. So anyway, I'm rambling. My review is this: Nice looking, wonderful appliance. Perfect for our purposes and applications. 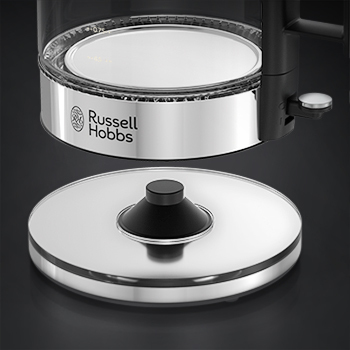 Rated 5 out of 5 by Peg0 from Excellent product Got a Russell Hobbs electric kettle a while ago. Liked it so much that I got one for a friend. Great operation. Pretty blue light when operating. Really fine quality kettle! Rated 5 out of 5 by Shelly from Great kettle! I just bought the same exact kettle, but a Farberware brand, at Wal Mart for $21.95. Rated 5 out of 5 by Laurajj from Beautiful and Easy To Clean! I love the style and look of this kettle! It boils the water very quickly and it not loud at all. I LOVE the blue light that displays while the water is coming to a boil. Very pretty! The filter is very easy to remove and clean. It pours wonderful, no spilling or dripping. The safety features are my favorite! It will automatically turn off once the water comes to a boil, or if the kettle is empty! Very modern feel and look! Perfect for our kitchen! 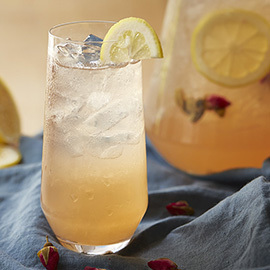 Rated 5 out of 5 by kimbiecom from This gem does much more than just tea water! I received this product to test and I am so glad I did. I use this probably more than any other small appliance except my coffee maker. I use it for more than making hot water for tea or cocoa. I use this to heat up water to make homemade bread, have a weed stuck in a crack that won't come out, yup pour boiling water on it, working on a stain and need hot water this is your pot! I love that unlike a tea kettle it turns itself off in case I get side tracked, and it doesn't use as much electricity as a microwave to heat up water. It can heat up 1.7L of water at a time which is convenient for company but I usually heat less at a time. It is very easy to clean which is another huge advantage over a tea kettle. All in all everyone who has seen me use mine expressed great interest in buying their own. 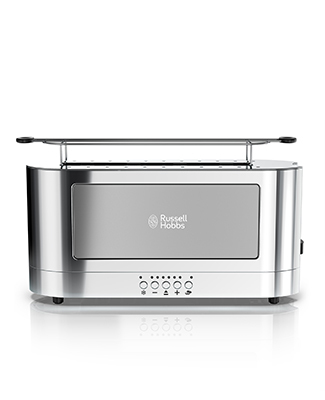 I recommend Russell Hobbs brand for the quality of the products they offer. Rated 5 out of 5 by Ron and Teter from Very well made product We owned a old Russell Hobbs electric tea kettle that we had for years that finally quit working. After going through several other tea kettles that never lasted even a year, we did an internet search to remember the make of our old long lasting tea kettle she purchased in England. 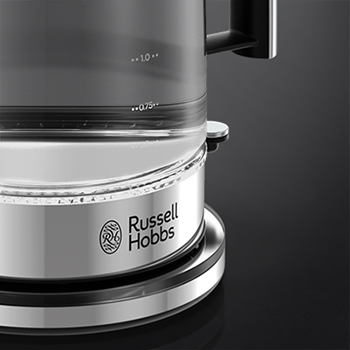 The rest is history, we love our new Russell Hobbs kettle and are convinced it’s the best tea kettle available! Rated 5 out of 5 by bbbbb from Very nice The tea kettle is attractive and very practical. Writing this review is a bit painful since it requires more characters than I originally wanted to put in.